You’ve researched and purchased the best free-trade coffee roast you can find, bought an airtight vacuum sealed canister to keep them optimally fresh, and now you’re all set to brew your favorite hot morning beverage. Not so fast. You still have to grind the beans. What is the correct procedure for extracting everything good from a coffee bean anyway? And for how long should you grind them? To pulse or not? And is that blade coffee grinder you purchased in 2004 doing you any favours? Grind size effects 3 factors in coffee: contact time, extraction time, and flow rate. The more surface area on the coffee bean, or how fine it is, the more exposure it has to water. And that water exposure decides everything. The more surfaces that interact with water the less time it needs to be there (contact time). The more surface area to interact with water means the less time is needed for the water to extract components (extraction time). Finally, grind size determines how fast, or slow, the coffee can physically move through the grounds (flow rate). The finer the beans are ground, the higher the extraction rate is and the less contact time is needed. Alternatively, the courser the beans are ground, the less surface is exposed, which means a slower extraction rate, therefore, more contact time is needed. The finer the grind, the slower the water can move through it. The courser the grind, the faster it can go through. All of this is a long way of saying that if your brew method has a short contact time (like espresso), the grind size should be finer. If your brew method has a long contact time (like French Press) the grind size should be courser. Why so much fuss about size? Because if you don’t grind your beans to the appropriate size for your brewing method you’ll have either over or under extracted coffee. Over-extraction happens when too many coffee components have been absorbed from the bean, and unfortunately, too much of anything is almost always a bad thing. Over-extraction can make your coffee taste bitter. Under-extraction is just as bad. This happens when not enough coffee components have been absorbed. The result is sour, acid, or even salty tasting coffee. These consequences happen with the wrong grind size, If your grind size is uneven, as blade grinders are apt to make them, you can have both under-extracted and over-extracted coffee in the same cup. How To Get The Grind Size Correct? Equipment. You can’t get serious about home brewing coffee if you’re still pulverizing your beans with a blade grinder. Blade grinders don’t cut the beans into uniform sizes. Also, the propeller action of the blade gets too hot which can scorch your beans. Both problems make a difference in how your cup tastes. A burr grinder has a set of rotating “burrs” that crush the beans to the correct uniform size. If you don’t have a burr grinder or don’t want to buy yet another kitchen gadget, don’t fret. You can still grind your beans moderately well by pulsing the grinder, tracking the time, and eyeballing the consistency. Burr grinders can produce the correct grind with just a press of a button. However each model is different. And if you only have a blade grinder available, you’ll have nothing but your eyes and instincts to gauge the right texture. Here’s a general guide for what you’re looking for in 7 types of grind sizes. Extra fine coffee grind should look like baby powder. To make extra-fine at home, use a burr grinder set all the way to the finest setting, or use a Turkish coffee bean mill. Blade coffee grinders are not a good option because it isn’t equipped to grind the beans this fine. Another option is to head to your overlooked grocery store coffee aisle grinder. Set it to “extra fine,” “super fine,” or “Turkish” and let it do the work for you. Turkish coffee or Ristretto uses extra-fine coffee. Fine ground coffee looks like regular table salt from your salt shaker. Drinks that use this type are espresso and stove-top Moka Pots. Use a per grinder per its instructions, or if you only have a blade grinder available, add 2 tablespoons of coffee beans per cup, and pulse the grinder for about 15 to 20 seconds until the grinds just start clumping together. Espresso is a drink where you really need your grind right, because a good shot is dependent on extraction time and density and the right grind will help with that. Medium-fine ground coffee looks like powdery Caribbean beach sand. Cone shaped filters, either from automatic coffee makers or manual pour-overs utilize this type. There is a deeper layer of coffee grounds in a cone shaped filter than there is in a flat shaped filter. This means that the water has more contact time with the grounds which means cone filters make a slightly stronger cup of coffee. Vacuum pots and siphon brewers also work well with this grind type. Medium-Coarse coffee looks like regular sand— not the powdery Caribbean kind, but the more northern course variety. 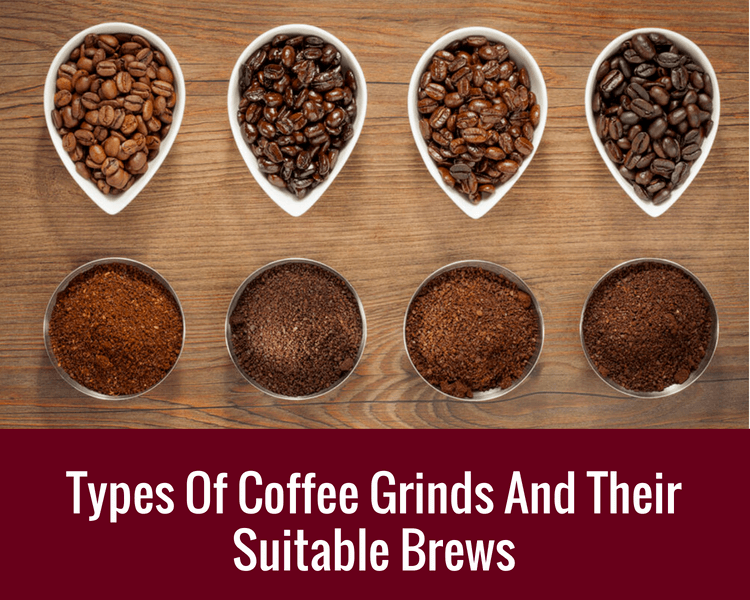 Automatic coffee makers with flat filters, some manual pour-overs, and Aeropress devices use this type of grind. Medium grounds are your basic coffee grind texture which most people visualize when thinking of coffee grounds. This is a good starting point to test your grinding skills. Get to a medium grind, and then adjust from there to see how the texture changes from fine to course. If you only have access to a blade grinder, pulse the coffee beans for about 10 to 15 seconds to get basic medium ground coffee. Medium-Coarse coffee looks like kosher salt. You can actually start to see little bean flecks in the course grind types. Chemex and Cafe Solo devices recommend this grind size because the manufacturers believe it to allow the best extraction and flow rate for their products. If the coffee is ground too fine the water won’t filter fast enough. If it’s ground too coarse, it will filter too fast and won’t pull the oils and good coffee components to give the best results. Coarse ground coffee is getting rockier, with sharp edges, and bigger bean particles present. Coarse ground coffee should look like sea salt or coarse salt. The French Press is the most common device to use this size. Your burr coffee grinder won’t be working very long to achieve this consistency, just a few seconds. If you only have access to a blade grinder, pulse the coffee beans for only 5 to 10 seconds to achieve the coarse ground coffee size. On the opposite spectrum from Turkish or extra-fine grounds, extra-course is the chunkiest ground size. The coffee beans are spending just a few seconds in the grinder to break up the beans to an extra-course chunky size. Coffee types that use extra-course grounds are cold brews and cold presses in which grounds spend an extended amount of contact time with the water. For comparison, the water contact time for espresso is about 30 seconds. Cold brews can be up to 12 hours or more. Let take it the other way round. If you are just looking at a type or a couple types of drinks. These are the grinds that you will want. Espresso uses around 7 grams of finely ground coffee to make the base of almost every drink in your favourite coffee house. If you like your caffeine straight and without any fuss, drink it alone from a demitasse cup like the Italians do. To grind the perfect shot of espresso, the beans need to be the correct grind consistency (fine), and then tamped just right into the portafilter. If it’s too loose the water will find weak spots resulting in over and under extracted coffee in the same cup. If it’s too compact it won’t pass through quickly enough. Take your time and practice to get it right. A double espresso,, or espresso doppio if you want to get all Italian about it, is just as the name implies: two shots of espresso served in the same drink. A single espresso is approximately 1 ounce of pure unadulterated espresso. A double espresso is simply twice the fun at 2 ounces of espresso, or 14 grams of finely ground coffee in one cup. Since the timing of extraction is so important, doubles are often made simultaneously in a dual-spout portafilter. The goal is to extract approximately 2 ounces in 25 to 30 seconds. Ristretto means “restrained” or “restricted” in Italian. It’s made with less water than a single espresso, but the same 25 to 30 second extraction time. Sometimes called a “short shot,” a ristretto is about 3/4 the size of a single espresso. This drink is espresso enthusiasts who find that a regular single shot of espresso just isn’t quite concentrated or jolty enough. The coffee grind is perhaps a touch finer than you would use for espresso, bordering on extra-fine. It can also be ordered as a double. Buckle up after you drink this. Lungo means “long” in Italian, meaning a long pull to allow in extra water for the extraction. This drink is usually a double espresso extracted for twice the length of time and double the water of a regular espresso. If the goal for an espresso pull is about 25 to 30 seconds, the goal for a lungo is about 40 to 60 seconds. The result is about 3 ounces for a single, or 4 to 5 ounces for a double. It's flavor is less concentrated and more bitter because of the extended contact time with the water. The coffee grind should be fine as with an espresso. Folklore claims that an Americano was born when a homesick American in Italy went looking for something resembling coffee from back home. What he got was something much better. It’s made with a 1:2 ratio of finely ground espresso to hot water; so 2 ounces of espresso in a cup with 4 ounces of hot water added to it. The end is a beautifully layered drink with thick espresso on the bottom, crema floating on top, and a mix of the two in between. Whether the folklore is true or not, citizens of the world have made the simple yet sophisticated americano a favorite cafe menu item. Sometimes called a “backwards americano.” If you took an americano and reversed it, you’d have a long black. Originating in Australia or New Zealand, the long black is made with a 1:2 ratio of water and espresso. It’s made by pouring a double shot of finely ground espresso or extra-finely ground ristretto over 4 ounces of hot water (instead of adding hot water to the espresso). The rearranged combination makes a decidedly different flavored, stronger drink, with a more pronounced crema layer on top. Originating from Italy of course, the cappuccino in its basic form is composed of 1/3 espresso, 1/3 steamed milk, and 1/3 foam. A good cappuccino is all about the thick, frothy, meringue like foam floating on top. It begins with a finely ground double shot of espresso. Steamed milk is then poured in while the barista holds the foam back with a spoon. To finish it, the reserved foam is spooned on top. Cappuccinos can also have subcategories of “wet” or “dry” which is in reference to how much milk is used compared to foam. A dry cappuccino will have less milk and an even heavier layer of foam, and a wet cappuccino will have more milk with a regular amount of foam. You can even order a “bone dry” cappuccino which has no milk and only a foam cap on top. Want To Share This Infographic On Your Site? Copy The Code Below! 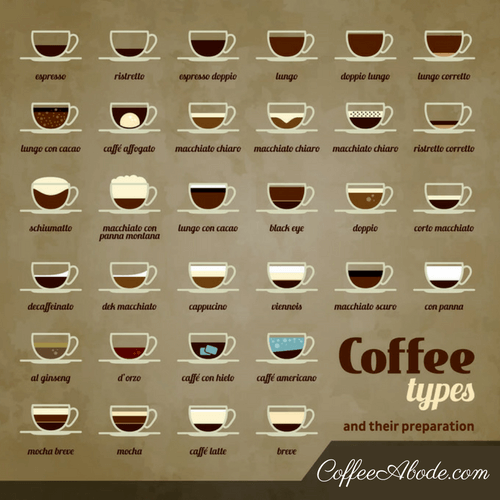 Please include attribution to coffeeabode.com with this graphic. This drink hails from either Australia or New Zealand, no one seems sure which because both want to take credit for this luxurious drink. The flat white, sometimes called a “wet cappuccino,” is made of a double shot espresso made from finely ground coffee, and then 4 ounces of very fine micro-foamed milk. Getting the milk steamed to the right consistency seems to be the hallmark of this drink which is then poured directly into the espresso to meld together. The flat white is opposite of the dry cappuccino which has a lot of foam and little milk, while a flat white has no foam but lots of smooth steamed milk. Another Italian born drink, macchiato means “stained coffee” or “spotted coffee” in its native language. Macchiatos can be made as an espresso macchiato or as a latte macchiato. For the former, a short black is “spotted” with just a touch of steamed milk. It is small potent drink for coffee lovers who don’t want a lot of milk complicating their espresso. A latte macchiato is just the opposite—steamed milk “spotted” with a shot of espresso, the result is a beautiful layered coffee with espresso and milk swirling together. Caffè lattes are one of the most popular drinks in coffee houses. Since latte means “milk” in Italian, it makes sense that this is a very milk heavy coffee drink. The latte is made with lots of milk of any fat content, or substitute milks like soy, almond, or coconut. Syrups of any flavor are often added to result in something of a lightly coffee flavored drinkable candy bar. The ratio of a latte 1/3 espresso to 2/3 steamed milk. A 5 ounce latte is built by layering 3 ounces of steamed milk over 2 ounces of espresso made from finely ground coffee. Speaking of candy bars, how about some chocolate? One of the classic flavor combinations of the world, something truly magical happens when a cocoa bean meets a coffee bean. Truly a match made in heaven, the strong and sweet flavors bring out the best in each other. Mochas, or mocha lattes follow the basic latte preparation. 2 tablespoons of chocolate syrup (or white chocolate syrup, or both) is mixed with 2 ounces of espresso made from finely ground coffee before steamed milk is added. Add whip cream to the froth, sprinkle with cinnamon, nutmeg, chocolate powder or chocolate shavings and you have something truly indulgent in your hand. This potent coffee drink is fun to make and an experience to drink. It requires extra-fine ground, or Turkish ground, medium roast coffee. It is made in ornate Cezve Turkish coffee pots over a direct low heat and served in Turkish coffee cups, which are like espresso cups, but a little taller. They can be made with or without sugar, but beginners are probably going to find the sugar version more palatable. Turkish coffee is unfiltered coffee; the grounds don’t dissolve, but sort of sit on the bottom of the cup in what looks like and is called “mud.” Whether or not it lasts like mud is a matter of opinion. What do you do when your regular drip coffee just isn’t buzzy enough? Add espresso to it of course. These super-caffeinated drinks go by different names depending on where you are and what coffee house you’re at. A “dead eye” typically means 3 shots of espresso added to any size mug of basic black drip coffee. A “red eye” usually means a scant 2 shots of espresso added. Milk and sugar can be added at the drinker’s preference, not that it really matters. Whether you pick a dead eye or a red eye, you’re not going to sleep any time soon. A frappe can mean something different depending on where you are in the world. The most common definition in the United States is that a frappe is what happens when espresso is mixed with ice cream. The drink seems to have originated by a greek representative of Nestle in the 1950’s who may have inadvertently started the whole iced coffee trend. Obviously the drink has evolved, morphed, and varies from wherever you happen to be ordering one. For instance, the greek frappe version is made without ice cream, but a foamy semi-solid whipped mixture made from sugar, instant coffee, ice, and water. In the northeast US, a frappe is synonymous with milk shake, and coffee may or may not be included. One thing is certain, no matter where you are, frappes are sweet and delicious on a hot day. Whether you’re making a casual automatic drip coffee or trying to perfect the delicate balance of a latte macchiato, so much is riding on getting the right size and consistent coffee grind. If you don’t you will sabotage your efforts before you even put the grounds in the machine. Guidelines are after all guides. Don't let it stop you from getting creative! Experiment with different grind sizes for your drinks and you might be discover a unique blend!